A glance at the box may put you off playing ‘The Legend of the Mystical Ninja’ but perhaps the amount of Japanese cultural references should entice rather than put you off this RPG platform hybrid. During the 16bit era Japanese publishers couldn’t seem to agree on what European gamers actually liked to play. Two decades ago Square decided that we didn’t have a taste for RPGs, so ‘Chrono Trigger’, and ‘SuperMario RPG’ and ‘Seiken Densetsu 3’ never reaches our shores. Konami however felt we actually had an appetite for Japanese oddities. Europe was the only Western region to get to enjoy ‘Parodius’ and all the non-sense that came with it. ‘Pop ‘N Twinbee’ didn’t reach America but found a home here and then there was ‘The Legend of the Mystical Ninja’. 1992 was a time when, in the UK at least, when anime was considered niche and only broadcast late at night. Sushi was misunderstood and not sold in restaurants or super markets. Samurai were only seen in parody movies and were it not for Honda in ‘Street Fighter 2’ it’s likely that the British wouldn’t even know sumo wrestling was a thing. The West was embarrassingly ignorant of Japanese culture yet someone at Konami decided that a translation of ‘Ganbare Goemon: Yukihime Kyuushutsu Emaki’ would be welcomed in America. Admittedly it took a further two years for the game to be available in Europe but many believed it was a game worth waiting for. Super Play magazine called it "one of the best games for the system (if you like this sort of thing), mixing RPG adventure-style wandering with side-on platform action.” It was celebrated in the book ‘1001 Video Games You Must Play before You Die’ and years later Games Radar ranked it as their 45th best SNES game owing to it’s "stellar ancient Japan-inspired soundtrack and beautiful graphics alive with colour” concluding that ‘The Legend of the Mystical Ninja’ is “definitely one of the top games on the SNES." 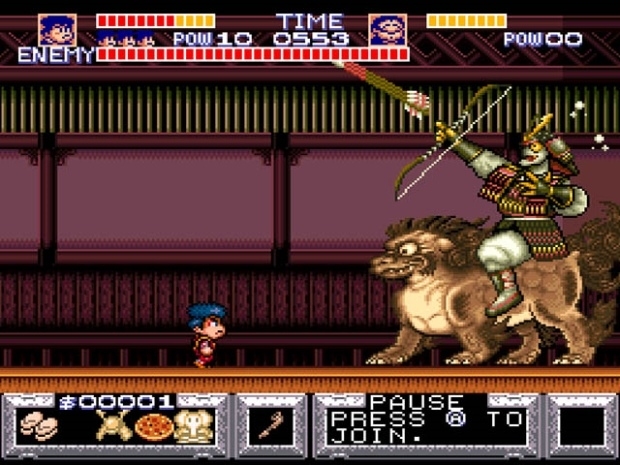 The game is actually the fourth title to feature Goemon; a comedic character loosely based on Ishikawa Goemon a noble thief in Japanese folklore. The series would ultimately span 26 games (not including remakes) and most are based in a cartoon version of Feudal Japan that’s inspired by authentic Japanese myth and legend. The game’s abstract story no doubt baffled westerners but long time Goemon fans may also be a little confused. 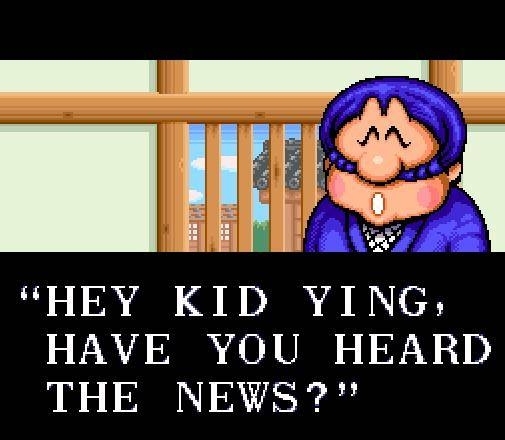 Main series protagonists Goemon and Ebisumaru are bizarrely called Kid Ying and Dr. Yang in all non-Japanese releases (which are an odd choices given that the Yin Yang Symbol has Chinese rather than Japanese origins). For those new to the series, which would have been most of the West, ‘Legend of the Mystical Ninja’ probably seemed initially impenetrable. “You're dropped into the middle of a typically baffling Japanese story with precious little idea of what you're expected to do, let alone how you should do it” notes EuroGamer in a retrospective review. “Some context or an explanation of what's in store [...] would certainly help players hit the ground running”. The tale told in ‘The Legend of the Mystical Ninja’ revolves around cats and ghost princesses. After noticing some odd occurrences in their hometown of Oedo (or Horo-Horo if we trust the game’s American box) Goemon (Kid Ying) and Ebisumaru (Dr Yang) decide to investigate. They are lead and battle with the Ghost of Kurobei freeing a ninja cat. As far as I can tell, she needs help finding her boss Koban who was last seen on Shikoku Island and hires our heroes to help. It’s an adventure that takes them to festivals populated by suspicious Hyotoko dancers ruled by an evil Lantern Man who is holding Koban captive. This rescue reveals that Princess Yuki has been kidnapped by the Otafu Army which seems to be made up of mimes and clowns living in a bizarre amusement park on Awaji Island. Their defeat reveals that the Otafu Army frustratingly never had Yuki, but an Old Wise Man living in Iga knows who does. Of course The Old Wise Man is guarded by an army of robotic clockwork ninjas. As seems to be par for the course, reaching the Old Wise Man is another false lead. Fortunately he does offer Goemon the "Miracle Transport Machine"; a cannon that fires our dynamic duo around different regions of Japan. Using this it’s hoped that they can find the real location of the princess. If reading all that confused you, you’re certainly not alone. “I have no idea what’s going on” wrote one Super Pro reviewer “but at least it plays well”. The game opens in a town setting viewed from a typical RPG style top down perspective. 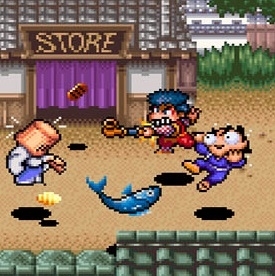 Unlike the friendly villages of Role playing games, ‘Legend of the Mystical Ninja’ demands that Goemon must explore the dwellings inexplicably hurting anyone who gets in his way. Gameplay is comparable to something like ‘Renegade’ or ‘River City Ransom’ but sadly without the range of moves seen in ‘Streets of Rage’ or ‘Batman Returns’. Essentially you’ll hammer one attack button and collect items; usually money but sometimes you'll find other helpful items such as a magical wish-granting cat statue (that will power up your characters weapon) or Scrolls (which you'll exchange for ability upgrades throughout the game). In each town you rampage through there's a dozen or so buildings that contain information or material help for your journey. In these you’ll meet your standard One-line townsfolk who seem surprisingly willing to give advice to any young ninja who barges into their houses after assaulting their neighbours. Other buildings are shops selling all your standard RPG fare, but more exciting are the building that offer mini games. Among these games is a memory quiz, a one arm bandit style gambling machine, a painting challenge that plays a lot like ‘Snake’, a ‘Breakout’ clone, whack-a-mole, an air-hockey game, horse racing, a horrible confusing 3D maze and astonishing also the entire first level of space shooter ‘Gradius’ (spruced up for the 16 bit machine no less). Some of these games can reward you with money, others are just for fun. Finding a friendly Tanuki statue shifts the gameplay entirely though. It seems ‘The Legend of the Mystical Ninja’ can’t decide if it’s an RPG, scrolling beat em up or a platformer. “Put simply, you explore a town amassing items and playing mini-games, and then head to a platform-leaping action section which ends with a boss fight” points out reviewer Dan Whitehead. Usually when a game tries to do too many different genres at once it ends up not doing any of them well. Typically the individual components of a game don’t stand up to scrutiny when looked at independently. This is certainly not the case in ‘The Legend of the Mystical Ninja’, where the platform stages are as fun as the village exploration. “Everything’s been blended into a coherent seamless whole” felt Super Play Magazine. Very few platforming levels only require you to only move from one edge of the screen to the other though. 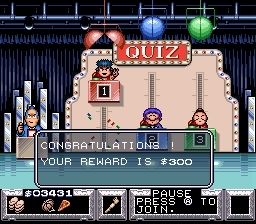 ‘The Legend of the Mystical Ninja’s designers have really pushed the boat out, continually throwing out different kinds of challenges. For example there are a few places in the platforming portion of the game that make you think three dimensionally. One stage sees you climbing a rotating tower leaping from posts as they turn and twist. Another stage is set in a waterfall where platforms move in and out of the screen rather than the traditional side-to-side movement. But if you stand on one of these, Goemon will shift between background and foreground layers and a player must navigate through the stage taking this into account. Levels feel hard but fair, and rarely will instant death follow making a mistake. A later level will see you leaping across balls that swing and bump into each other like a giant Newton's Cradle. Progression demands knowing to jump to where the balls will be, rather than where they are. Should you mis-time a jump you won’t die though, you’ll just have to redo your level progress up to that point. Thankfully controls are tight and Goemon is a responsive and agile protagonist. “The arcade platform sections are superb with real tests of skill as you battle through all sorts of hazards” claimed Mean Machines magazine. Levels might be crowded with foes but there are a variety of weapons to deal with them. Your default attack involves swinging a short pipe which can be upgraded twice during a play. However, getting hit by an enemy will downgrade your weapon one level. 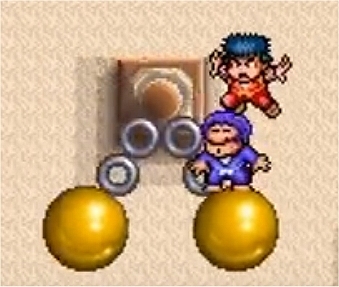 For long range attacks Goemon can hurl coins across the screen but this understandably this will cost you money. It’s worth the expense though as coins are probably the best weapon you can use on bosses later in the game. 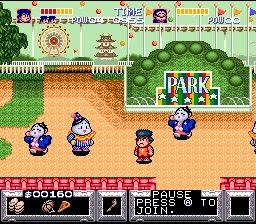 ‘The Legend of the mystical ninja’ is a challenging game especially in its second half. To beat a boss you have to spot their attack patterns which would be a chore if they weren't so adorably quirky and wonderfully Japanese. Of course these boss battles become much easier if a second player joins and ‘The Legend of the Mystical Ninja’ is often celebrated for its two player co-op mode. A friend can join as Ebisumaru (Dr Yang) at any point, dropping in and out of play on the fly, much like an arcade game. You can even play against each other on a lot of the mini games and many, like air-hockey, are much more fun with two. “Should you have a pal ready to play, simultaneous two player action is the order of the day” believed Mean Machines Magazine. “The game itself isn’t significantly different but it’s possible to climb in the other’s shoulders so whilst one walks in one direction the second player can attack in the opposite direction”. Be it platforming, brawling or mini game sections all the graphics are astounding, especially considering this game was released in Japan during the Super Nintendo’s first year of life. Some stages (like the waterfall or carnival) are exceptionally eye-catching. The screen never feels cluttered with a clean precise look defined by vibrant colours and the occasional 3D effects give everything a tangible depth. It’s a world punctuated with cultural references that a true Japanophile will notice, yet one that would have been visually arresting to a nineties audience lacking an understanding of the nuances of Asia. Similarly the music really pushes the Super Nintendo’s sound chips for all they're worth. “Some of the best music I’ve heard on a console game” notes reviewer Julian Rignal. “The sheer quality and variety is outstanding”. There is some nineties era electro during some Mini-Games, but the majority of the music emulates the style and instruments of classic Japanese music. I can catch all of the sounds that I've associated with traditional Japanese music in the past; the plucked strings, bamboo flutes and hand drums are all there. “You'd be hard-pressed to find many superior scores in the rest of the SNES library” noted IGN when reviewing the Wii Virtual Console re-release. This celebration of Japanese culture also feeds into the game’s genuinely funny moments. The localisation team should be applauded for their restraint; brave enough to maintain the Japanese jokes but somehow making them still accessible to Westerners. “It’s funny, in an offbeat Japanese sort of way” said critic Jonathan Davis. “Seconds into the game you’ll be assaulted by men with fish. A little further on you’ll have to rescue a cat that’s been suspended from the ceiling on a rope. And there are plenty of out-and-out gags too [...] I smiled all the way through it”. During the 1990’s Localisations of games usually tried to conceal regional differences rather than embracing them. Rice balls became doughnuts and school girl uniforms became the outfits worn at sailing club. 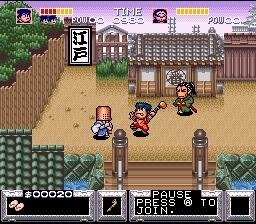 ‘The Legend of the Mystical Ninja’ gave many in The West a first glimpse at undiluted Japanese culture. You have to wonder if we would have the ‘Persona’ games, ‘Katamari Damacy’ or ‘Okami’ today if it weren’t for the cultural pride inherent to this SNES game. It’s a very self aware game that doesn’t take itself seriously for more than a few seconds. Each character you meet on your journey seems to have their own quirky personality, often as bonkers as the situations in which Goemon finds himself in. With references to the Konami code and fourth wall breaking humour, there are many subtle throwaway jokes and references that you'll miss if you rush the game. ‘The Legend of the Mystical Ninja’ is therefore a game to savour, rather like a glass of the finest Japanese Suntory Whiskey. If you're interested in this culture then ‘The Legend of the Mystical Ninja’ is something you can’t ignore and there’s even the chance it will become one of your favourite games. For Christmas a dear friend gave me 'The Legend of the Mystical Ninja' as we both share a love of Japanese culture. It was an excellent choice of game for me, an under rated gem that's sat unplayed on my shelf for far too long!